← The Eurovision Song Contest – you’re awful, but I like you…. In 1868 Queen Victoria wrote a disturbing note to the then Home Secretary. She was deeply unhappy ” to see the failure of the evidence against all but one of the Clerkenwell criminals… it seems dreadful for these people to escape…one begins to wish these Fenians would be lynch-lawed on the spot”. What had so worried the Queen that she should suggest such a thing? 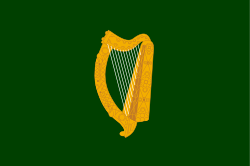 The Fenians – both the Fenian Brotherhood and the Irish Republican Brotherhood (IRB) – were organisations established in the 19th century to promote the cause of Irish independence. Becoming a Fenian meant that not only did one accept the right of Ireland to be free and independent but also that such freedom could only be achieved through an armed struggle. It was a term that came to be feared by many Londoners, particularly from the 1860s onwards. In the autumn of 1867, thousands of people attended rallies on Clerkenwell Green to plead for clemency in the case of three Fenians sentenced to hang in Manchester, but the petition to the Queen failed and they were executed on 23rd November. Just a week earlier, two men had been arrested at gunpoint in Woburn Square in Bloomsbury and it transpired that one was an Irish-American gun runner and leading member of the IRB, Richard O’Sullivan Burke. Charged with treason he was remanded to the Middlesex House of Detention at Clerkenwell, now the site of the Hugh Myddleton School. From that moment plans were made to free O’Sullivan Burke by means of a complicated escape plan, organised using secret notes written in invisible ink on the back of letters to his sister passed on through the prisoner’s solicitor. On 12th December 1867 a barrel of gunpowder was pushed against the prison wall, but it failed to ignite and the attempt to free Burke was postponed. This was a critical moment. Between that attempt and the second just a day later, the police had been alerted to the plans by British Intelligence in Ireland and the prisoners were moved to the other side of the prison. On the 13th December, unaware that their plot had been uncovered, three people were seen to wheel a tarpaulin-covered cask into Corporation Lane (now Row) on a barrow. They apparently asked a local child for a light and then lit the fuse. The explosion was huge. A hole 60 feet wide was blown in the wall of the prison and it is most likely that if Burke had been in the exercise yard on that side of the institution, as he had been the day before, he would have been killed in any event. However, it was the tenements in Corporation Lane that suffered the greatest damage from the blast – number 39 was just eight yards from the wall and the effects of the explosion were felt streets away. Twelve people were killed and more than forty injured. Talk at the time claimed that twenty babies ‘died in the womb’. Indeed Disraeli, who just the day before the blast had controversially banned political demonstrations, found public opinion turning his way as frightened people began to think it the only way to stop the regular marches in support of a group capable of such carnage. In the immediate aftermath of the events of 13th December Scotland Yard panicked. The Pall Mall Gazette quoted the Metropolitan Police Commissioner Sir Richard Mayne as saying there were some 10,000 armed Fenians in London. 50,000 Special Constables were immediately sworn in and sewer workers were called upon to support police searches under public buildings. Government offices had their floors covered in sawdust to protect against ‘Fenian Fire’. 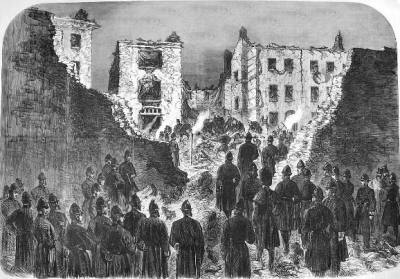 Although a number of people were arrested and brought to trial in relation to the explosion, many of the cases collapsed and one man alone received the death sentence. Michael Barratt was a member of the Fenians but always maintained that evidence against him in this case was fabricated to ensure at least one person was convicted. He gave an emotional speech from the dock, admitting his love for his country but asserting his innocence of the crime. However he was found guilty and sentenced to hang. Despite many appeals for clemency Barratt was eventually executed outside Newgate prison on the 26th May 1868. His was the last hanging in England to take place in public and he dropped to the jeers of a crowd of more than 2000 people. The ‘Clerkenwell Outrage’ was the first time London was faced with an Irish Republican bomb, but it was not the beginning of a campaign as many feared. Historians of the Fenian Movement suggest that the events caused as much concern for the Fenians and the IRB as it did for London. The backlash against the Irish community that followed the explosion led the Movement to fear that it was not just the Queen that might favour lynch mobs. Any expression of Irish Nationalism in the decade after Clerkenwell was decidedly orderly and low-key. The Special Constables stood down and the atmosphere calmed somewhat. It was a brief interlude however. The 1880s would be the decade when Home Rule agitation prompted the start of an organised and lengthy campaign of terror in London. It something the capital is alert to even today. This entry was posted in History and tagged Clerkenwell, Fenian, history, Independence, IRB, Ireland, London, Republicanism, Victorian. Bookmark the permalink. A timely and informative blog, given our Queen’s visit to the Republic. Interesting history and it fills in a gap in my knowledge – I had heard of the Fenians but didn’t realise how it affected London life at that time. Thanks Suzie! I was on a guided tour to this very spot a matter of weeks ago, so fresh in my mind, nice to read the story with some meat on it, so to speak.